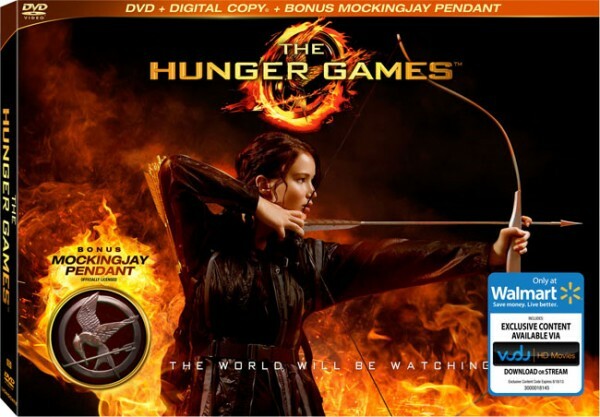 The Hunger Games comes out on DVD and Blu-ray this Saturday and on Friday night various stores such as Toys R Us, Walmart, and Blockbuster Video will be hosting midnight release parties across the United States. However, if you’re just going to be picking up your video and then having an awesome viewing party at home, you’ve of course got to have great Hunger Games themed food, right? Here’s a list of things you can serve based on recipes I’ve posted here on Fictional Food so that you can host a party Capitol style. 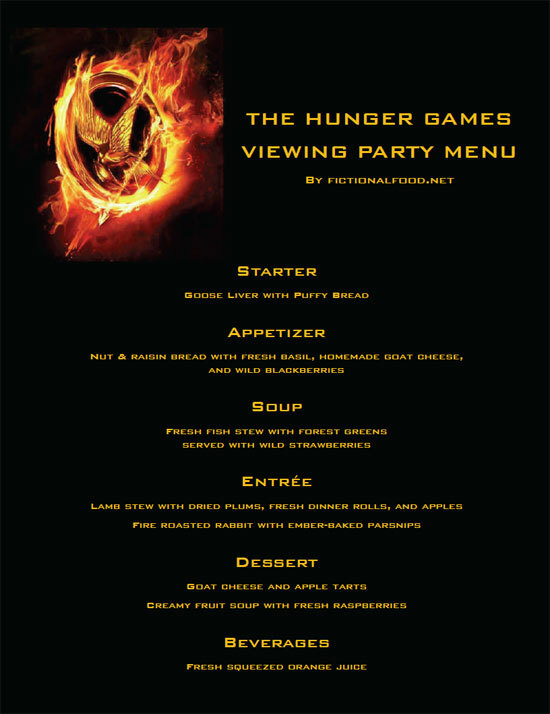 (cause let’s be real, a District 12 meal wouldn’t have a menu) Download a PDF of this menu. For the starter, there’s Goose Liver with Puffy Bread. I made these pretty decently sized, but if you want to make them much smaller, that would make for a great hors d’oeuvre. The recipe would make any chef scream I’m sure, but you want your party to be a success, right? The appetizer course is fresh Nut and Raisin Bread with Homemade Goat Cheese and wild blackberries. To simplify this if you don’t have the time to cook it all or like me, have no idea where the heck to go to find wild blackberries, buy a loaf of artisan bread with nuts and raisins, goat cheese, and blackberries. For the soup course, I’ve listed down Fresh Fish Stew with Forest Greens since this is more of a soup-like consistency than a thick stew. Serve with fresh strawberries. If they’re not picked in the forest, I don’t think your guests will be too angry. As an entree, I have two main courses listed, one is the ever popular Lamb Stew with Dried Plums. The fresh dinner rolls and apples give it a star-cross’d lovers flair, bound to delight your Capitol guests. Since Katniss’ style of eating is bound to be trendy after this year’s Games, serve them some Fire Roasted Rabbit with Ember-Baked Parsnips. I don’t have a recipe for the parsnips, but it’s not rocket science, you just lay them on your dying fire’s embers (or bake them in the oven!). Dessert has a light option with the Creamy Fruit Soup with Fresh Raspberries and a more hearty option with Goat Cheese and Apple Tarts brought in specially from Mellark’s Bakery in District 12. For beverages, you can obviously serve your best wine, but for the younger crowd, simply make some frilly straws and serve chilled orange juice! Hope that helps you plan out your party! Have a great weekend and if you’re going to a release party, have fun!